The key to intelligence is the willingness to question things. It is particularly important to be willing to question the things that most other people assume to be correct, even when they haven't made the slightest effort to think about the principles involved. 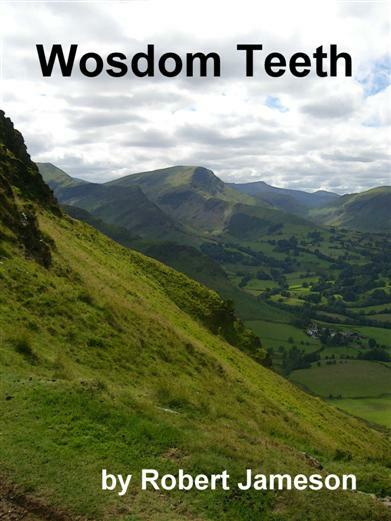 Wosdom Teeth, like the other Wosdom books (which can be read in any order), offers provocative opinions in order to encourage readers to think beyond the politically-correct prejudices of the society they live in. Warning: Many people would consider this book to be deeply offensive! Why is the term, 'sexual predator' used, pretty much exclusively, as an accusatory and derogatory term? What, when you really bother to think about it, is actually wrong with being a sexual predator? It is ridiculous the way people are referred to and smeared through the use of the term, 'sexual predator' as if that's a bad thing. Since the dawn of mankind, people have gone on the hunt for a sexual partner. They've had to. The survival of the species depends on such activities. Aren't nearly all of us sexual predators at some time in our lives? Isn't it the primary job of a male to hunt down and ensnare a fertile young woman to act as an incubator and mother to his offspring - and thus enable them both to continue their genetic lines? Is he taking advantage of the natural attraction the young female feels for him? In a sense, yes, but what's wrong with that? That's how the species is continued. That's how the reproductive urge works. Generally, when people use the term, 'sexual predator,' it isn't because they think there is anything wrong, as such, with the idea of someone seeking out a mate. They just disapprove of certain people or certain match-ups and they want to be able to claim that their objection to a particular relationship is something to do with an overarching principle rather than the symptom of their base prejudices - which is what it actually is! When they approve of a man's quest for a mate and the way he goes about it, that's fine, but when they disapprove, they want to call him a sexual predator. They're just trying to put a sinister spin on something they don't approve of. Very often, the term, 'sexual predator' is just a tool for propagating and excusing ageism. People don't usually use the term for two similarly-aged people, but when a middle-aged man has a relationship with a much younger woman, they call him a sexual predator. They like to assume, without any evidence, that the older man must in some way be preying on - being abusive towards - the younger woman. That's just straightforward prejudice that is no better than outright racism or sexism. Similarly, the term 'pervert' is used almost exclusively in a derogatory way - people are derided for being 'perverts.' In particular, older men who enter relationships with much younger women are often derided as 'perverts' - but what's wrong with being a pervert? What is a pervert? A pervert is someone with unusual or abnormal sexual tastes. They deviate from the norm. Well, what's wrong with deviating from the norm? Consider homosexuals for example. According to the dictionary definition, they're perverts because their sexual tastes deviate from the norm. This doesn't necessarily mean they've done anything wrong. They're just different. Someone with a shoe-fetish is a pervert. They have unusual tastes - but that doesn't mean they are evil. They're just different. And if a middle-aged man's sexual preference happens to be for much younger women, then he may be deviating from accepted norms, but that doesn't mean he's done anything wrong - so why should he be treated as if he has? Throughout history, there have always been deplorable examples of people being discriminated against simply because they are different. We've fought against racism, sexism and homophobia. So, on the same principle, why don't we campaign against prejudice towards perverts? A pervert is just someone whose sexual tastes deviate from the norm. Using the term 'pervert' as a form of abuse suggests that there's something fundamentally wrong with being different and having unusual tastes - but there isn't, so why do we do it? Other chapters include: Feminism - Gay Marriage - Turbans - Naturism - The Paralympics - The Right to Discriminate - and many more!